Liquidity in the banking sector has crashed and banks’ borrowings from the central bank have exploded in a matter of days, at least according to the official statistics. In the last week of December 2018, local banks still reported healthy daily liquidity positions with the figure published by the Bank of Namibia, just below N$4 billion. This constituted local commercial banks’ combined positions in Namibia and in South Africa. Less than a week later, by 02 January 2019, the banks’ overall position has gone below one billion dollars for the first time but it came back the next day, hovering above one billion for three days. On Tuesday, 08 January the overall liquidity position tanked again, going below one billion dollars, and from there it has never recouped. Thursday, 10 January, the banks’ local position went negative for the first time since 09 May 2017. The overall position remained marginally positive. Last week Friday, however, even a small N$80 million holding in South Africa could not offset the local deficit and the overall position went negative for the first time. This week, the overall position has continued to deteriorate, hitting minus-N$818 million on Monday, and on Wednesday, Namibian banks reported an unprecedented local deficit of more than N$1.1 billion. 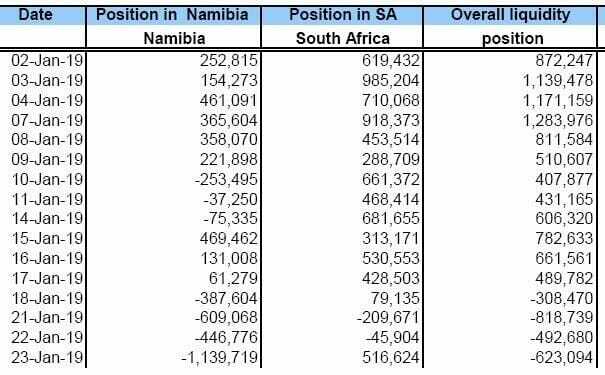 A positive position in South Africa of N$516 million did help to improve the overall position to only minus-N$623 million. In the meantime, Bank of Namibia Repos, i.e. money lent by the central bank to commercial banks, exploded, from N$1.3 billion at the beginning of January to more than N$2.8 billion on Wednesday this week. Bank of Namibia Bills, i.e. money deposited by commercial banks with the central bank, have remained a static zero since 02 January. Speaking to several analysts revealed the absence of a consensus position on the reason for the dramatic decline in banking liquidity. One possible reason mentioned, was the significant tax payments made by companies to the Ministry of Finance on 31 December, but this was estimated not to exceed N$1.5 billion, leaving at least another N$1.5 billion unaccounted for. Another opinion was that the lack of a premium in the local Repo rate was prompting banks to switch their own so-called NCDs (Negotiable Certificate of Deposit) from Namibian to South African assets. Futhermore, it was pointed out that NCDs must be held to maturity implying that local liquidity will not quickly turn positive. The flipside is that buoyancy in the capital market remains elevated. Up until last week, all tenders for government debt continued to be oversubscribed by as much as five times for internal registered stock, and around two and a half times for treasury bills. Other sources in the commercial banks stated that they are unaware of any liquidity problems, citing capital market performance as a clear sign of high liquidity but failing to explain the zero BoN Bills position. Their only concern was the central bank’s methodology to assess daily liquidity saying that the published figures often fail to reflect real trading liquidity.